The great Fall migration is passing over Rockport. Countless bird populations, ducks and geese and cranes, draw formations in the cold air as they move south in flocks along the cloudless blue roadways. Other migratory birds, shy, tiny birds, wrens and warblers, are also on a mission south. 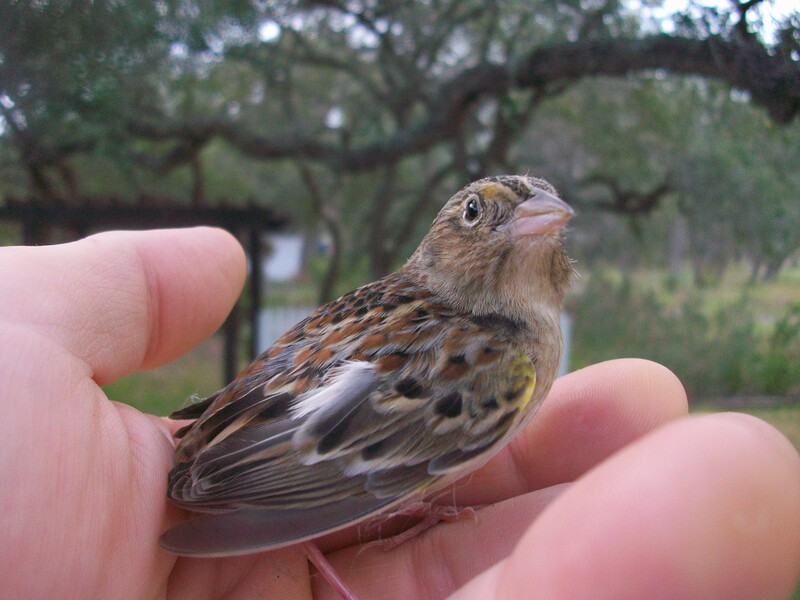 You must hunt carefully in the trees for these little birds, in shrubs, in tufts of grass at the edge of the forest. The Killer, my guard cat, has been hunting these passers-through. When I see him with one in his mouth and try to catch him, he runs like an Olympic sprinter to escape with his prey. This morning, I found The Killer poised ten inches from a small bird he had caught and been playing with, ready to pounce when the bird flinched. I was quicker than the cat for once and scooped up the terrified bird. The tiny heartbeat vibrated in my palm, the beats so fast there was no rest between notes. The rhythm gradually slowed in the cupped warmth of my hands. The beats were rapid, but steady and sustaining. I held the bird up to the light, worried there was a broken wing, punctured breast, or some other mortal injury. A few times the bird tried to open his wings, but they closed again. The bird turned to look at me, as if to comprehend this phenomenon, this unbelievable contact with a human spirit. I tried to communicate empathy through my hand, kindness. I told him through my fingers that this is a safe place to rest, to gather yourself. The bird stood on his feet and I felt the tiniest scratch of claws in my hand as he took hold. Without moving, the bird was gone. I traced the streak of his flight into the trees. He was free again among the wind-driven branches, free to slip back in to the great migration. I wonder which image he will take with him on his journey south: the fierce claws that held him down, or the gentle hand that lifted him up. Let me today remember, and give thanks, for the everlasting love in the hand that so many times has lifted me up, to gather myself, and take flight. Justin, your writing is just wonderful! What a lovely reminder about thanking our Creator! Hope you & Kayla had a great Thanksgiving! We enjoyed BBQ ribs from your farm! Daren wants me to buy more for our trip south. So glad Kimmi stocks everything at Coastal Bend!